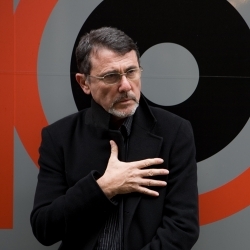 Shlomo Sand, image by Olivia Grabowski-West. Shlomo Sand shot to prominence and controversy with his 2008 book The Invention of the Jewish People. His follow-up, The Invention of the Land of Israel, examines a nationalist mythology of land which forms a crucial part of the Zionist story of, and justification for, the Jewish State. In this interview Shlomo talks to Lewis Turner about his journey re-discovering his country’s history, his hopes for Israel’s future and the role of historians in social change. First of all it was a bestseller for ten weeks. Secondly, a few weeks after it was a bestseller one of my colleagues, a historian from Haifa University, attacked me very strongly, but it wasn’t serious so I decided not to respond. I was covered nicely by Ha’aretz, in a long interview. But it’s not so easy for a lot of people to read these books, I know that. I respect them, but I don’t respect the fact that people don’t want to accept what I think is true about the past and true about the present. I started this voyage five years ago, when I decided that I have to deal with Zionist and Israeli history because it was too easy for me to be occupied only with European history.But when I started to touch Jewish history, some people became crazy. Historians today in Israel, I can compare them to British historians a hundred years ago.You have to know I wrote [Land of Israel] because I was criticized by a lot of Zionist historians, and to give you one example, because I started the book with it, is your Simon Schama. In the Financial Times he accused me of wanting to cut the relationship between Jews and the Land of Israel.This wasn’t my purpose in the first book. I tried to read over again Jewish history to see if what I learned in school was right, and I discovered an unbelievable thing, as an Israeli citizen, as a historian – I can tell you that 10 years ago I believed that Judean society was exiled by the Romans. Discovering that it’s a myth, it was shocking for me. In the framework of the Masters Studies programme at Tel Aviv University I invited a very famous researcher on the Bible. This is the first time that something started to move inside me. This very, very careful guy gave a lecture and he said that the exodus from Egypt never happened. He said that the kingdoms of David and Solomon are myths. I decided to write a book about this discovery, to compose the Bible as a historical book, because Shlomo Sand and all the children in Israel are studying the Bible as a historical book, not as a theological book. Now, after Simon Schama accused me, and he wasn’t the only one, I understood also that the insistence of Zionism, of Zionist historiography, Zionist politics about the concept of a people, has to do with the fact that people have territories. And then I understood that I have to move into understanding what is a homeland, what is a national territory; and that is the second book. From 1967, most of the intelligentsia, the intellectuals, in Israel, were against the occupation. At least in 1948, Israel gave citizenship to the Arabs that stayed, but from 1967 there was an entire population without any rights. They didn’t feel good because they are liberals, socialists, Zionist liberals, Zionist socialists, but they continue to claim the historical right of the Jews on the land because 2000 years ago they were expelled from there. I never, never, even before writing the two books, believed in the historical rights of the Jews on the land after 2000 years. Now, they treated the Land of Israel, not the land of the state of Israel, as a homeland. But the real homeland, the mythological homeland, in the schools, in the educational system is not Jaffa, it’s not Tel Aviv, it’s Jerusalem: Arab Jerusalem. It’s Hevron [Hebron], it’s Bethlehem and Jericho. This is the real mythological homeland. By the way, you have to understand I am not against the existence of the Israeli state, in the 1967 borders, but Tel Aviv is for me a homeland without historical justification. Not even the Shoah, it’s not an excuse. The fact is we exist. We have to look for a compromise. I believe that the interest of the Israeli society is to go back to the 1967 borders, to give the Palestinians a state to exist beside Israel, and to change Israeli society to a democratic republic. But you have to know that the state will be the state of all its citizens, and not the state of Simon Schama. Which means taking away the law of return [by which any Jew can take up Israeli citizenship]? Lewis Turner is a London-based writer. He has spent time as a journalist in Palestine and Egypt.